Sui Hongjin could receive fresh corpses from a variety of local sources. The drive from Wang Lijun’s transplant operation in Jinzhou City to Dalian is about four hours. Wang Lijun was, as noted, a protégé and right-hand man to Bo Xilai. Bo was the mayor of Dalian from 1993 to 2000 and later Governor of Liaoning Province in 2002. During this time, he invested one billion RMB to carry out prison expansion and reconstruction throughout the province, and to build new large-scale prison facilities.7 In the vicinity of Sui Hongjin’s corpse factories, there are Liaoning Province Prison No. 3, Dalian Nanguanling Prison, Dalian Labor Camp, and Yaojia Detention Center. For the nine years between 2004 and 2013, Sui Hongjin’s several exhibits toured more than 60 cities in more than 20 countries. The number of visitors topped 35 million.17 In 2005, “Bodies—The Exhibition” in the US had become the main source of earnings for Sui’s partner, Premier Exhibitions. 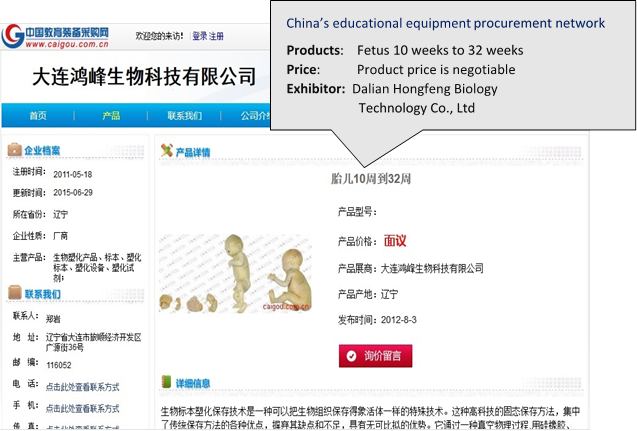 In 2008, at the request of the Attorney General of New York State, Premier Exhibitions posted a disclaimer23 on the exhibition’s official website and at the New York exhibition site, citing “Dalian Hongfeng” as the source of human body specimens. Below is the translation of a transcript of a call made to Sui Hongjin by an investigator from the World Organization to Investigate the Persecution of Falun Gong.24 The investigator assumed the identity of a Party investigator and asked Sui about his business operations, including the provenance of the corpses. The call was made in late 2012, a period of great political uncertainty in China, not long after the purge of Bo Xilai. Investigations were being launched into many of Bo’s former colleagues, as well as his wife, Gu Kailai. These conditions would have helped to give Sui Hongjin the impression that he was speaking to a Party disciplinary investigator. 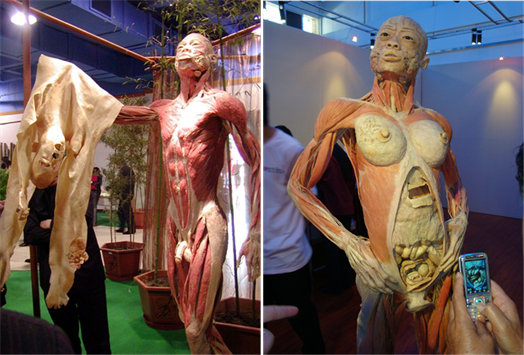 "Exhibition gives a look inside the human body"
"China Turns Out Mummified Bodies for Displays"
"Beijing held human body exhibit [Photos] Source: Sohu.com Date: April 6, 2004 Author: Nayuan, Luxin"
"Human plasticized specimens Source: Rizhao China rz.gov.cn May 12th, 2004"
"Forensic – Postmortem Interval/fresh Source: baike.com"
"Sui Hongjin: Ten Years of grinding sword – joys and sorrows Source: China Association for Science and Technology Web site April 20th, 2011"
"Recording of Bo Xilai’s Voice Confirms CCP Brutality Against Falun Gong Source: MingHui.org September 17, 2013 | By He Yu"
"Corpse factory investigation Source: Orient Outlook magazine Date: November 27, 2003"
"Dalian Hagens suspected using death-row prisoners for body exhibition Source: Southern Metropolis Daily Date: August 23, 2012"
"Announcing the bids on the human specimens and Medical Services of Mudanjiang Medical College Source: Mudanjiang city government official Website February 15, 2012"
"Investigative leads: The Corpse Plant in Changchun Suburb and The Body Specimens Library at an Amateur College Source: Minghui Net May 17, 2006"
"Fetuses 10 weeks to 32 weeks Source: China’s educational equipment procurement network August 3rd 2012"
"“World premiere of the Human Body Exhibit – Dublin February 2” (Ireland) By Kathleen Harris, 24th January 2012"
"Multimedia Kft brought The Human Body Exhibit to Budapest HK Exhibitions Inc"
"Human Body exhibit marked by controversy"
"Human Body Exhibition kick off in Belgium"
"Life Mystery Museum, Jinshitan, Dalian Baidu Encyclopedia"
"Dalian-Based von Hagens Plastination Factory Suspected of Using Executed Prisoners’ Corpses in Exhibition Nanfang Metropolis News August 23, 2012 Reporter: Wang Xing Student reporter: Ruan Yang"
"Notice from Ministry of Health About the Re-Release of “Autopsy Rules” September 10, 1979 (79) Health Education No. 1329, Medicine and Health Administration and Enforcement Electronic Library September 10, 1979"
"Forensic – Postmortem Interval/fresh Must occur before the body starts swelling, within 1 to 2 days after death Source: Baidu Works Collection"
"Händler des Todes spiegel.de 2004-1-19 Von Röbel, Sven und Wassermann, Andreas"
"Dalian-Based von Hagens Plastination Factory Suspected of Using Executed Prisoners’ Corpses in Exhibition Source: Southern Metropolis Daily August 23, 2012 Reporter: Wang Xing Student reporter: Ruan Yang"
"Bodies the Exhibition – Disclaimer Premier Exhibitions"
"Phone Conversation with Sui Hongjin, Chairman of Dalian Hongfeng Audio recording:"
"Provisions on the Administration of Entry and Exit of Cadavers and Cadaver Management, Jointly Issued by the Ministry of Health, Ministry of Science and Technology, Ministry of Public Security, Ministry of Civil Affairs, Ministry of Justice, Ministry of Commerce, General Administration of Customs, State Administration for Industry and Commerce, and General Administration of Quality Supervision, Inspection and Quarantine Ministry of Health Website July 17, 2006"
"Proceeding Deeply and Widely to Open Wider to the Outside World Dalian TV – Dalian News November 23, 2010"
"CPPCC Proposal of “About Vigorously Developing Mystery of Life Museum” and Other Folk Cultural Industries Baidu Library – Chinese text library"